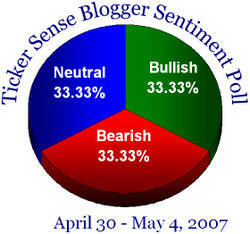 This week's Sentiment Poll is 100% neutral! First off, we would like to apologize for the lack of posts recently. We have been backed up but should be able to provide more substance starting next week. At the end of this week, which proved our Dow A/D theory to be quite wrong, we decided to highlight the S&P 500 sectors that are most Overbought or Oversold. 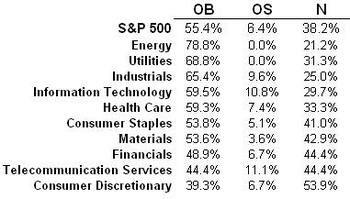 Below is a table showing the percentage of each sector that is either overbought, oversold or neutral. As we would expect a strong week very few stocks are oversold, with Energy and Utilities leading the pack; however, over one third of the S&P 500 remains neutral. The Trading Envelope appears below for historical comparison. There has been much speculation recently over when the Dow Jones Industrial Average will cross the 13,000 milestone. 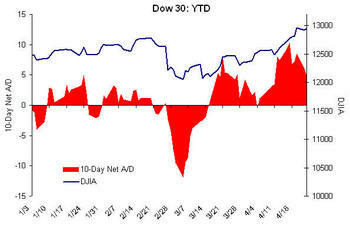 Below we have highlighted the Dow and it's 10-Day Net Advancers and Decliners. 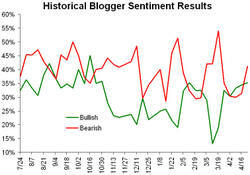 We noticed the weakness during the February sell-off and also the strength with which it rallied back. As far as the 13,000 mark, however, the A/D line says we may have to wait. 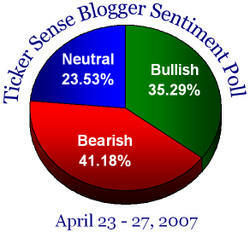 This week there are more bears than bulls in our Blogger Sentiment Poll. Historical results and participants are below. 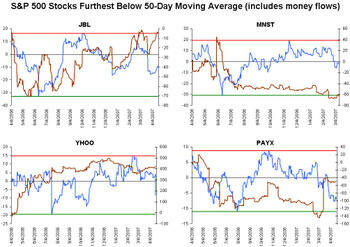 Below we highlight the 8 stocks in the S&P 500 that are trading furthest below their 50-day moving averages. We have also included their money flows to see what type of underlying accumulation is occurring in the stocks. For more information regarding our money flow analysis, please visit www.birinyi.com. 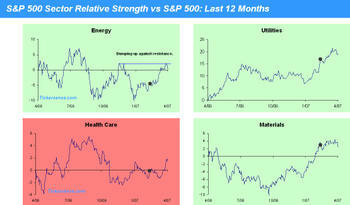 The charts below plot the relative strength of each S&P 500 sector versus the index itself. 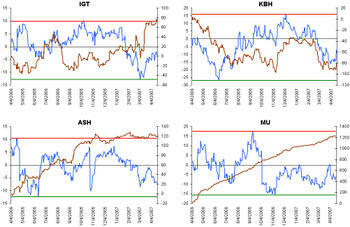 Rising lines indicate the sector is outperforming the market while falling lines indicate under-performance. 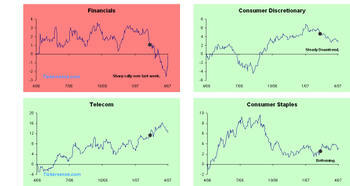 For reference, we have also marked 2/27 on each chart which was the day of the 3.5% sell-off in the S&P 500. Interestingly, while much was made of the decline, the day does not appear to have served as a fulcrum point for any specific sector. 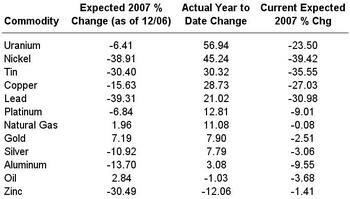 Back in December we posted commodity price forecasts for 2007 based on average analyst estimates. Below we revisit those expectations, provide the actual year to date change, and provide the new expected 2007 price change based on current commodity prices. 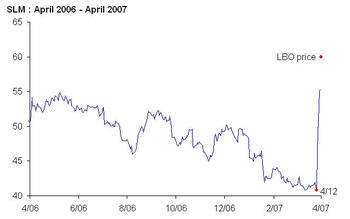 Uranium, expected by analysts to fall 6.41% in 2007, is currently up nearly 57% year to date. Nickel was expected to fall 38% but is actually up 45%. While we still have nearly three quarters to go, so far this year, commodity analysts have proven to not be very good prognosticators. They have also been slow to change their estimates, as due to the substantial commodity rallies, current price targets remain well below the actual prices. 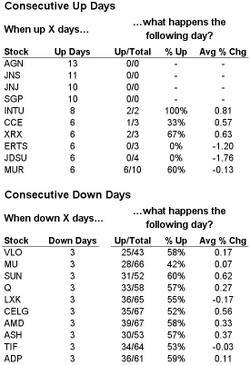 Below we highlight the S&P 500 stocks that have been up or down the most consecutive days. AGN is currently up 13 days in a row, JNS is up 11, and JNJ and SGP are up 10. None of these stocks have been up this many days in a row in the last four years. What Companies Aren't Fair Game? Late last year, one Wall St. strategist raised eyebrows when he argued that the S&P 500 was at such a cheap valuation that if it were a company it would be an LBO target. While the statement seemed a bit far-fetched at the time, recent events suggest that any company is fair game. Sallie Mae settles as student loan probe widens. Sallie Mae at center of ethics probe. Education official placed on leave after stock ownership disclosed. Yet, even amid all the scrutiny from several different fronts, Sallie Mae now finds itself in a deal to go private. And this isn’t just any deal. Before news of the deal made the rounds, SLM closed at $40.75 last Thursday. Today the stock trades at $55.36, and when the deal closes in late 2007, SLM shareholders will receive $60.00 per share in cash. If a company like SLM can get taken out for a 47% premium from where it traded last week, maybe the S&P 500 is fair game. Yesterday's reading of net new highs (285) on the New York Stock Exchange hit its highest levels since December 5th of last year. 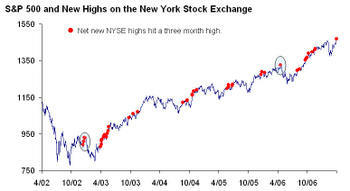 Some market watchers consider a large increase in the number of new highs to be a sign of market strength. 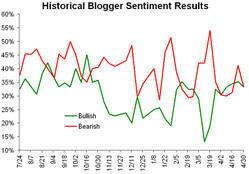 To test this we found each occurrence since mid 2002 where the net number of NYSE stocks hitting a 52 week high reached its highest point in three months. As the chart below details, there have only been two periods where the S&P 500 went into a notable decline (5% or more) in the days immediately following a three month peak in new highs.